Coal is the one product which Steffey & Findlay has sold since it began serving Washington County customers in 1873. An inexpensive and efficient heat source, coal is still used by many for either their entire heat source, for supplemental heat or for blacksmithing. Coal burns longer and hotter than wood and is less labor intensive. Anthracite coal is the most popular type of coal used in our county. 1. Anthracite Nut. Pieces of Anthracite nut are up to 1 ½ inches in diameter. In hand fired furnaces or stoves, Anthracite nut will burn for approximately eight hours without being attended. It burns without forming a crust and therefore does not need to be poked. Anthracite coal is more difficult to start than Pocahontas coal, requiring kindling and a low draft control. Because of the low draft control requirement, Anthracite nut is best used with air-tight stoves. 2. Anthracite Rice. 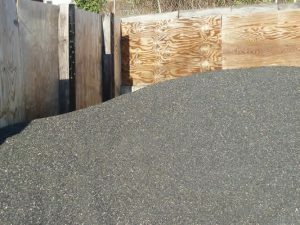 Pieces of Anthracite rice are up to 3/8 inch in diameter. It is used in automatic stoker furnaces that are controlled by a thermostat. The coal is fed from a hopper into the furnace when needed to maintain temperature. 1. Pocahontas Nut. Pieces of Pocahontas nut are up to 1 ½ inches in diameter. Pocahontas nut is used in hand fired furnaces. It is less difficult to start than Anthracite nut and is primarily used in non-air-tight stoves and furnaces. After a period of time, a crust will form on the burning coal and therefore will need to be poked. In addition to its use for heating, it is also used for blacksmithing. 2. Swords Creek Pea. Pieces of Swords Creek Pea are up to 7/8 inch in diameter. It is used in automatic stoker furnaces that are controlled by a thermostat. The coal is fed from a hopper into the furnace when needed to maintain temperature. It is also used in blacksmithing.